Running a business can be one of the most demanding things for anyone. When looking to run a business you will need to keep track of certain information. Some of this information is how much you are making and spending. As a result you will need to have an annual projected profit and loss forecast. This can help you keep good track of your income and expenses and also allow you to figure out how much you will make over time. With Excel you can use a template to help you evaluate your business finances on a regular basis. By keeping track of your income and expenses you will always know how you are progressing. The first part of the projected statement is income. This is recording the amount of money the company makes. When recording the income you will keep track of all of your sales and revenues. You will also keep track of costs of goods sold as well. Using the Excel template will give you a great tool to use when tracking your business income. On this template you will usually record sales, revenues, costs of goods and this will allow you to figure out your gross profit. If you are looking to project profits and losses then going over income is the first thing you need to do with this template. 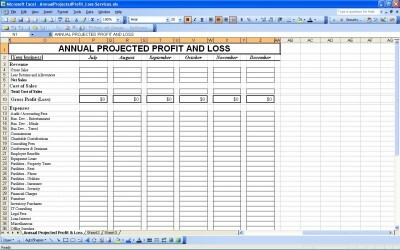 When using the Excel annual projected profit and loss template you will also need to keep track of the expenses over time. These are things such as rent, utilities, insurance and advertising. It is important to go over these things so that you will know how much it will cost to run the business over time. Having the expenses recorded and estimated will give you the means to make reliable predictions on how much will be needed to keep the business in operation over time. Thank you,now let me get to work.